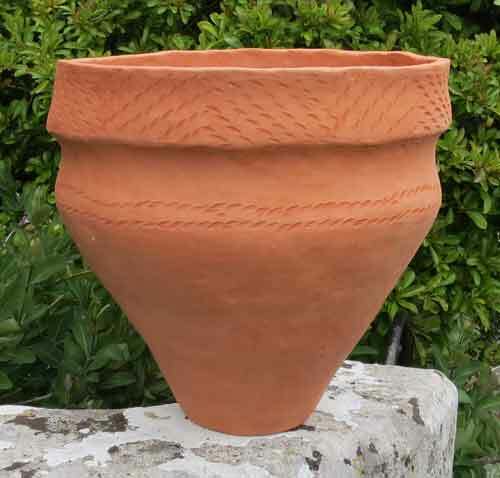 Bill Crumbleholme was commissioned to produce replica pottery for the visitor centre at Hengistbury Head, a multi-period trading port at the mouth of the Christchurch Harbour. The centre opened in late 2013 and again in spring 2014! The second opening, with the Great and the Good being thanked for their contributions. 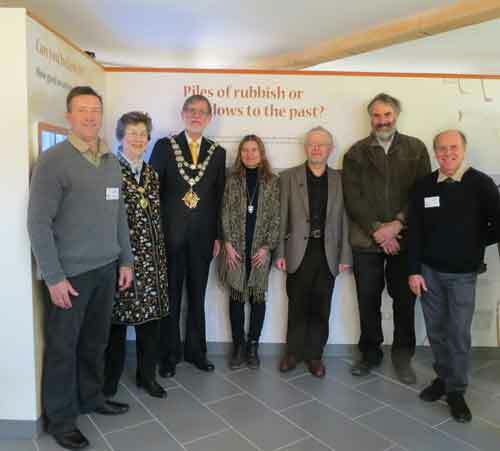 The first Opening - showing the brilliant banner title for Bill's efforts "Piles of rubbish"! 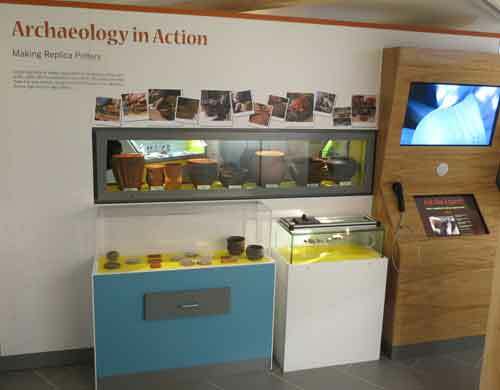 The display behind these good folk includes a collection of replica urns, beakers and bowls and round the corner is an "Ask The Expert" interactive video which features Bill explaining some of the methods he uses. There is a map of the locations at this link. 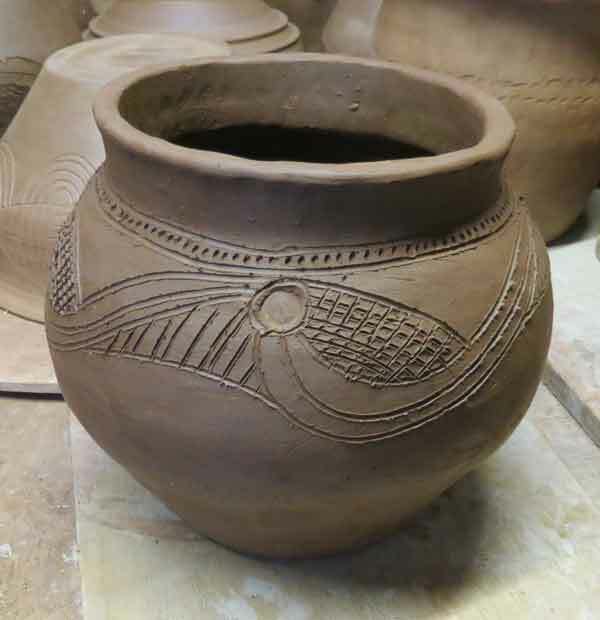 The pots that were finally selected for the display have been recorded at this link. 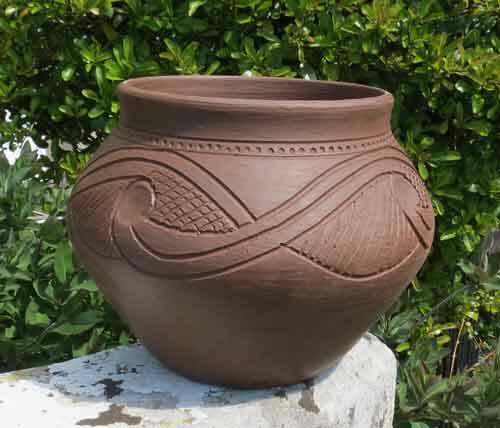 The pots that were made as back-ups will be sold, either at the new centre or by Bill on his travels. Workshops were run at the Head in mid April 2013, when people interested in the project were given a chance to see how Bill makes and fires the pots and have a go themselves. There is a page devoted to that event at this link. Bulk emails about this project are sent out using Mail Chimp to people who are interested. View the latest email at this link and also sign up receive future copies yourself. Email to Bill to receive alerts about this project and his other activities. This webpage can be looked at like a blog - in one long page, with the oldest posts at the bottom (after these introductions). 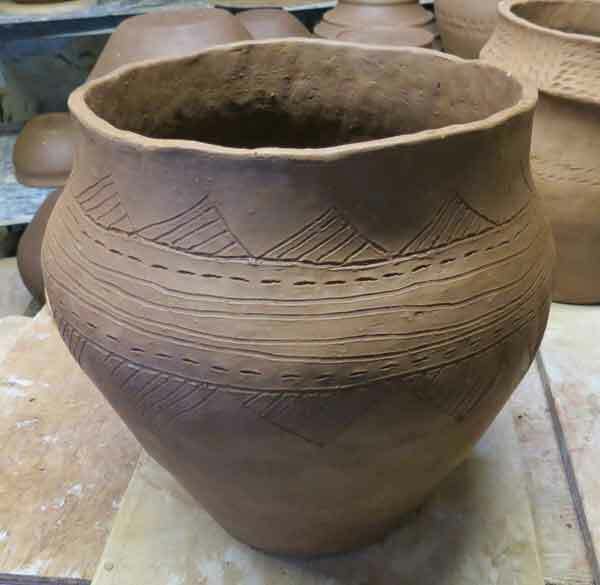 Bill researched and developed a range of clays and inclusions to use for the pottery, which covers styles from the Neolithic to the late Iron Age. 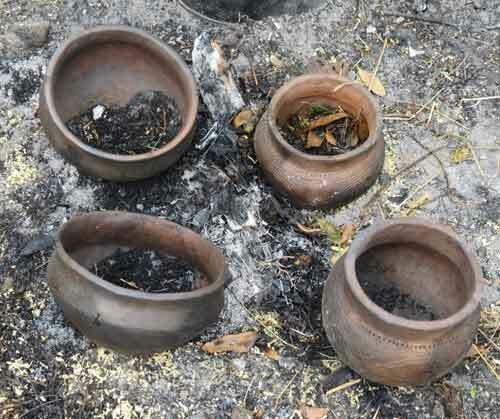 The final task was to blacken the Iron Age vessels, by smoking them in burning woodchips and dry leaves. 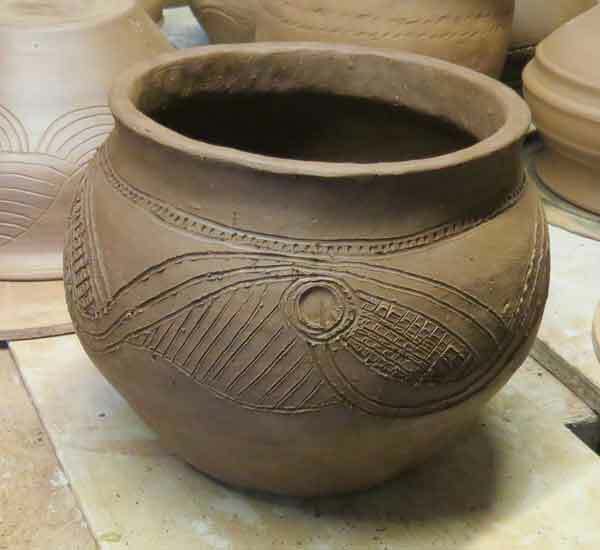 Bill fired many of his pots in his large wood fired kiln in August 2013, there is a webpage devoted to that firing at this link. 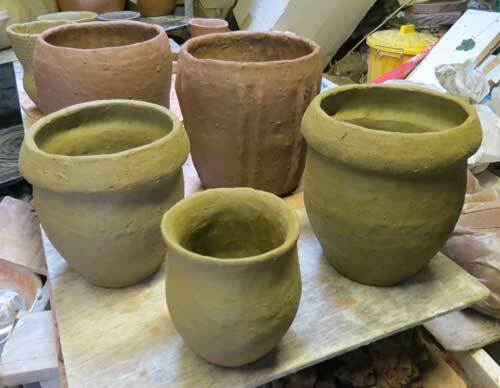 These are some of the pots selected for the display at Hengistbury Head, fired in the wood kiln and after a scrubbing to clean the ash off them. Some of them need to be smoked to turn them black, like the originals. 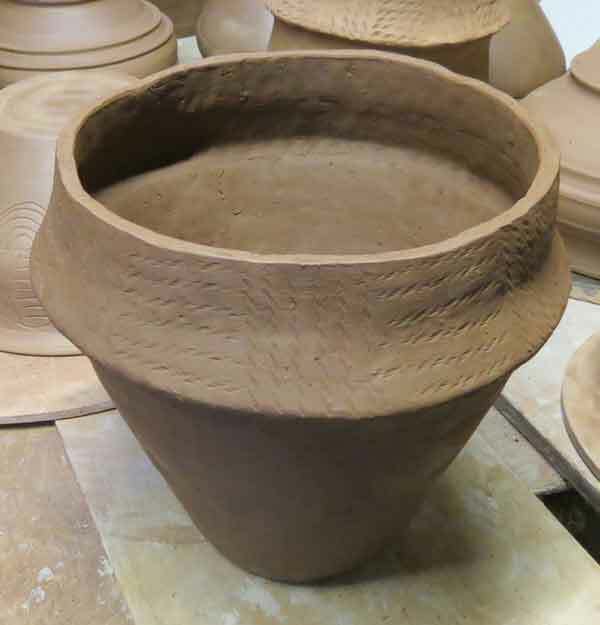 These are some of the pots made at the workshops run as part of the project, they were fired in the wood kiln. 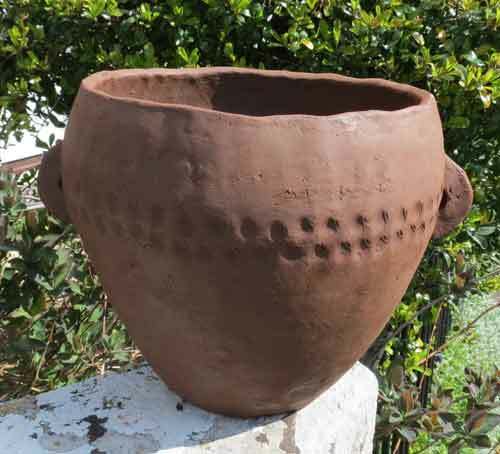 The Trevisker style urn replica - the largest vessel made for the project. The same urn, after contruction. They originated in Cornwall, often containing granite grit from the Lizard area. This needed help to construct in sections. 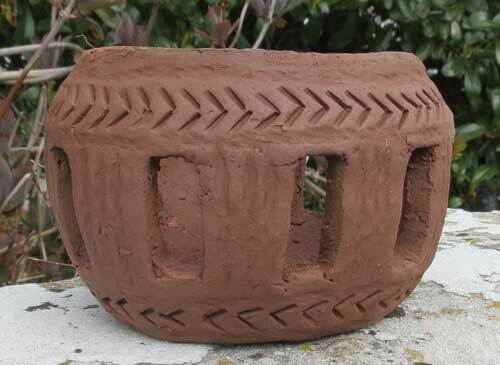 A Bronze Age Collared urn, with cord impressed decoration. A Glastonbury Ware bowl, with scratched flowing design. This is a smaller Glastonbuiry Ware bowl. 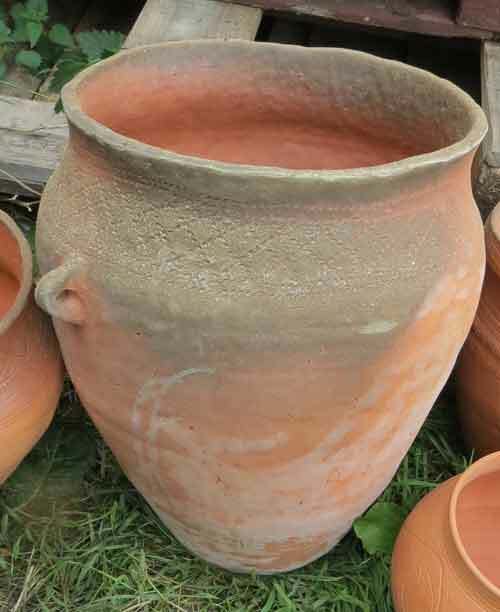 A smaller simpler Deverel-Rimbury urn. 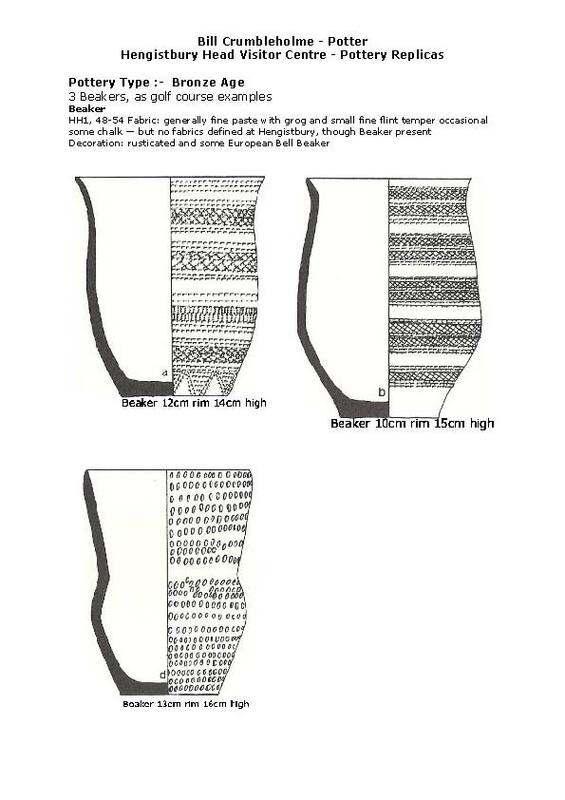 This zigzag decoration was impressed using a flint, the bands were pushed in with a blunt stick. A Deverel-Rimbury Urn, with a simple scratched design on a globular body. 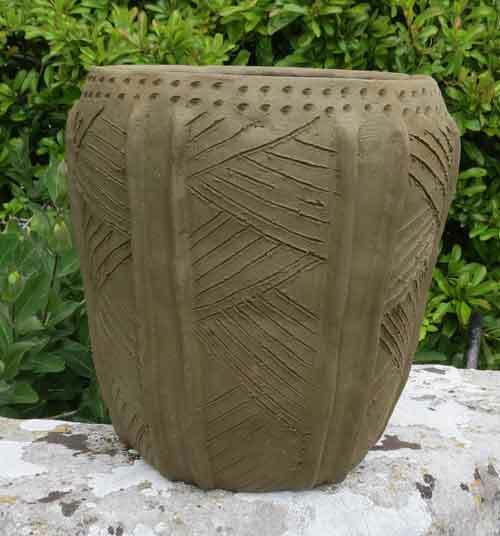 This pot was made while demonstrating at the National Trust "Spring Tide" event at Burton Bradstock. 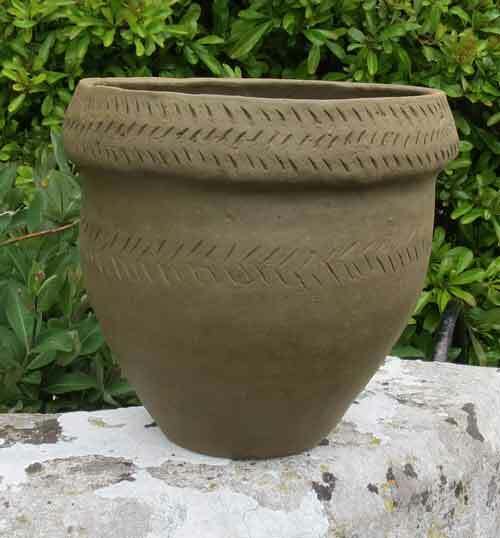 This is another copy of a Grooved Ware Neolithic bucket (made to replace the earlier ones which where made from clay from Hengistbury and then broken during the bonfire firing). 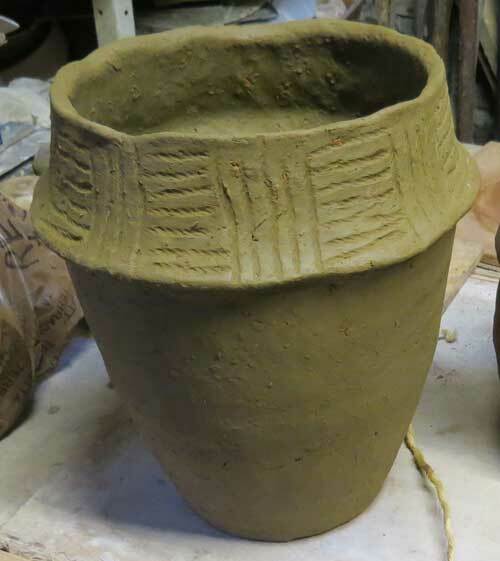 It was made from clay dug in Preston (very near the Rimbury Urnfield, so it will be used for those pots as well!). Some grog and builders sand was added to give some body to the clay which had been watered down to a slip, passed through a kitchen seive to remove the flinty granules and then dried out on a plaster bed. 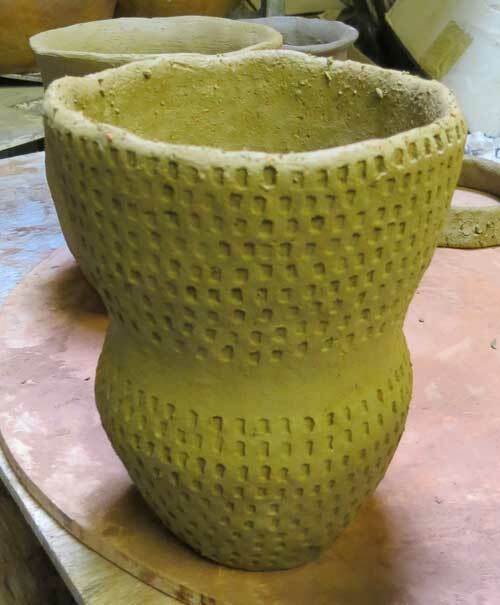 A test piece had been fired electrically to check it behaves well - which it does! 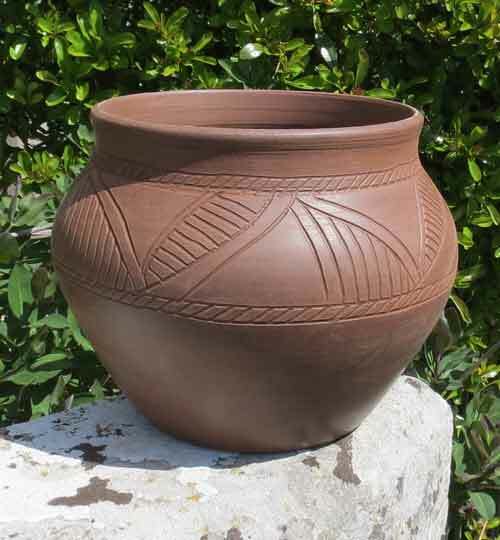 This is a Bronze Age collared urn made from the same clay. The decoration is simple thumb nail stabs. The urn was made from the same clay, but without the grog - just some sand. This is an electrically fired beaker. 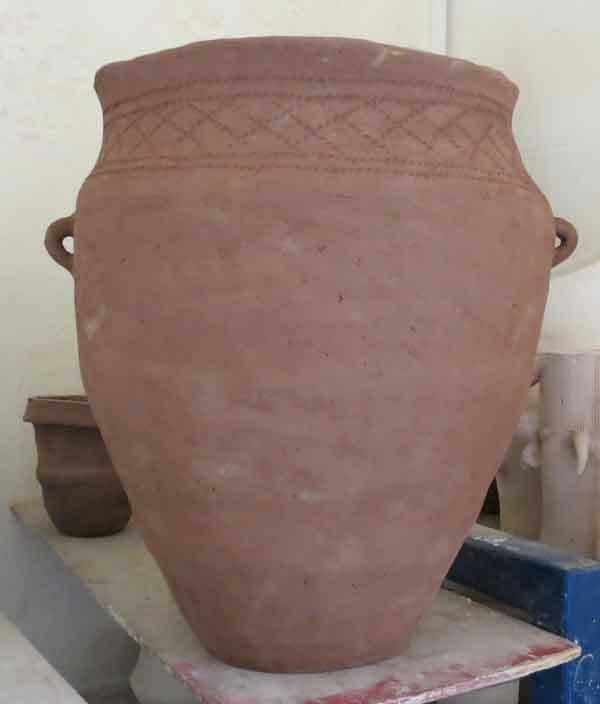 This is a large collared urn, electrically fired. 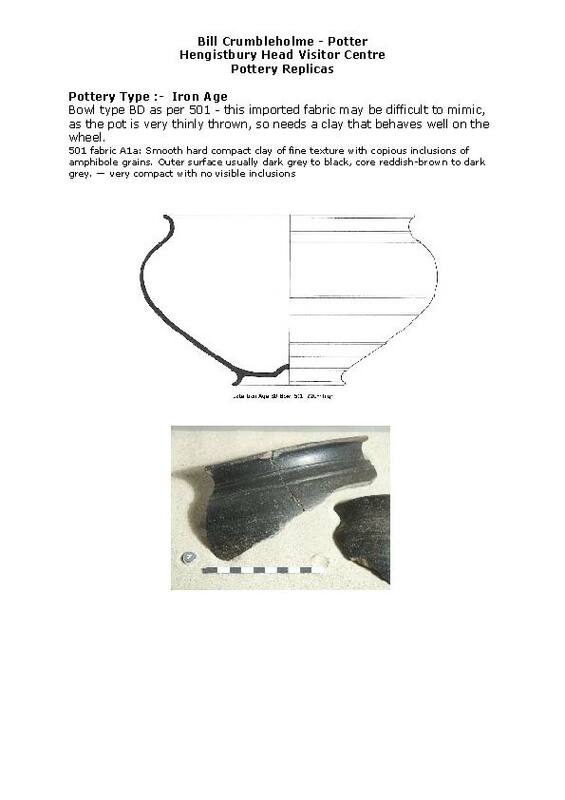 This and the two below are copies of Glastonbury Ware, mid Iron Age bowls with distinctive flowing incised decoration. These were thrown (to quickly produce some items that we could practice the decoration on), some more will be made by hand building using rings. 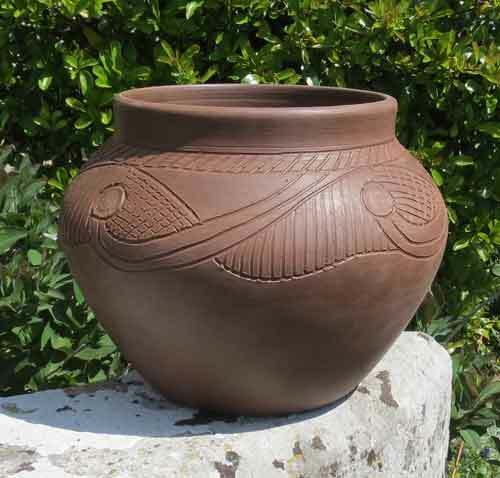 This is a copy of an Iron Age bowl, the originals were probably made in northern France, like this one thrown on the wheel using a fairly fine clay. 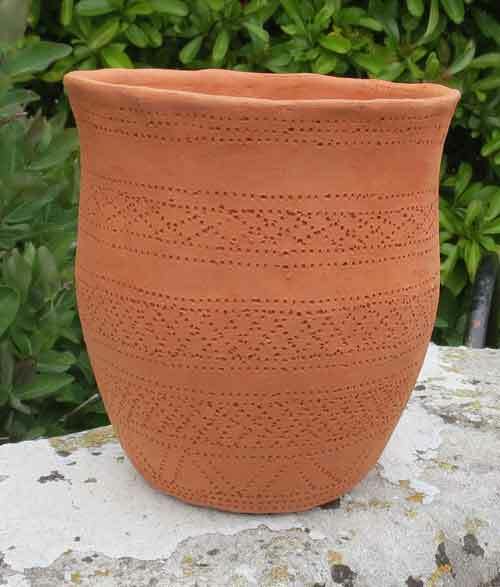 This is a copy of a Deverel-Rimbury bucket urn, with small lugs and a "rusticated" finger decoration. 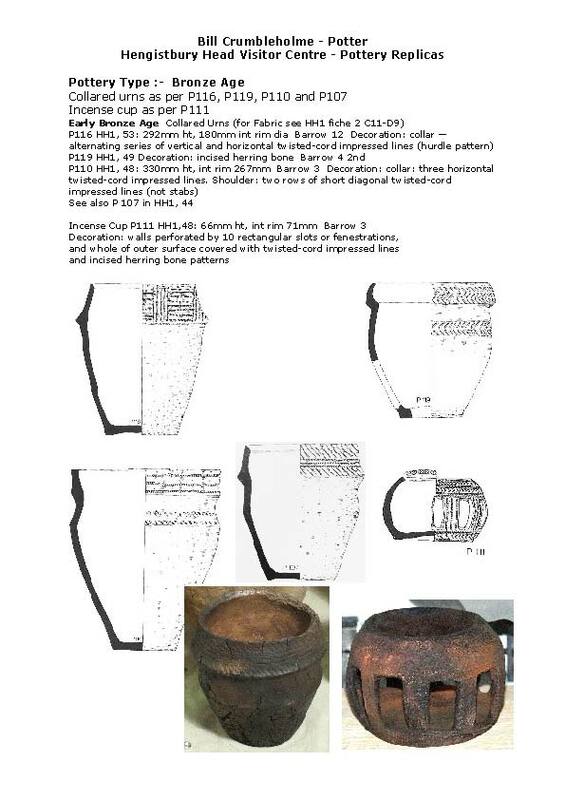 These were found in Bronze Age Urn fields, large cemeteries of buried urns containing cremated bones. A couple of days were spent video recording Bill at work, making and fired pottery at Down Farm, there is a description on a separate page at this link. 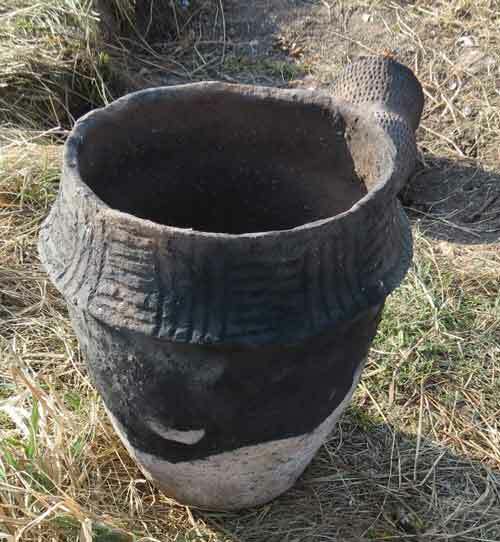 Collared urn fired at Down Farm in a small turf kiln. 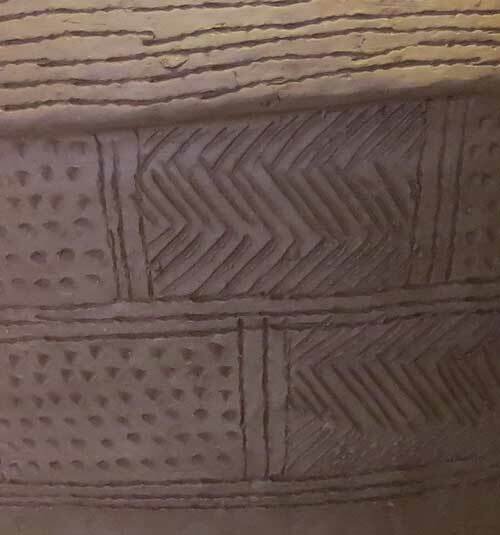 This is a close-up detail of the Grooved Ware pattern. 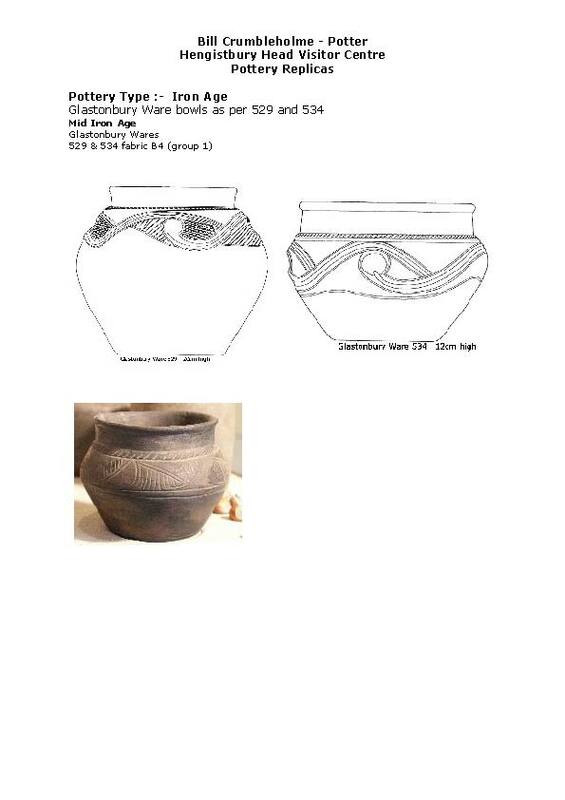 This is a copy of the "incense cup" found inside an urn at the Head. That description may be misleading as to its original function, but it looks like a very good guess. Another fairly similar type of pot was usually called a cheese strainer, but tests showed that it functioned really well as a "Bunsen Burner", fueled by rushes soaked in fat, to produce a very hot pin-point flame which would have been used by metal workers. 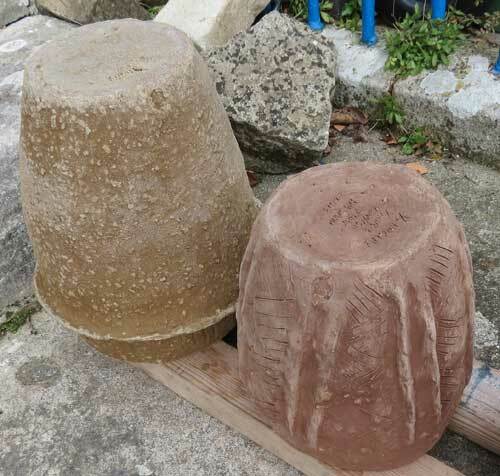 This is a couple of the urns after drying out - the clay from the Head that was part of the blend appears to be salty, as seen by the deposits of salt building up on the surfaces as the water evaporates away. 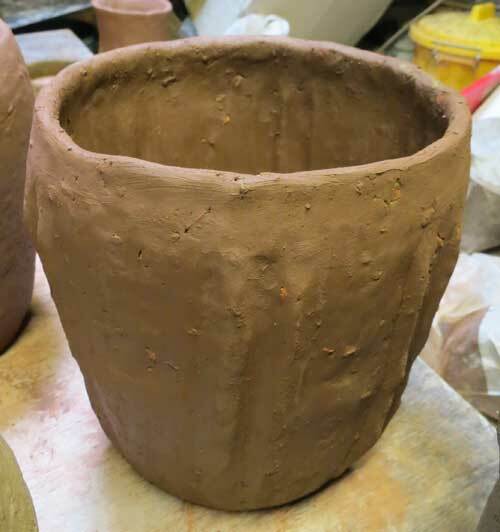 This is a collection of damp pots, some of the first ones to be made, they are now drying out before being decorated. 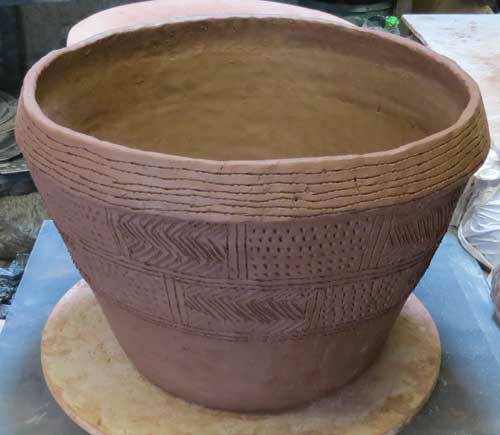 This is a "Grooved Ware" bucket, before the grooves have been made. Twin vertical ridges have been pinched down the sides. Note the coarser grade grog in the surface texture. These are buckets of "grog" which Bill has prepared by smashing and grinding pottery that broke during previous firings. The grog is shaken (& stirred!) 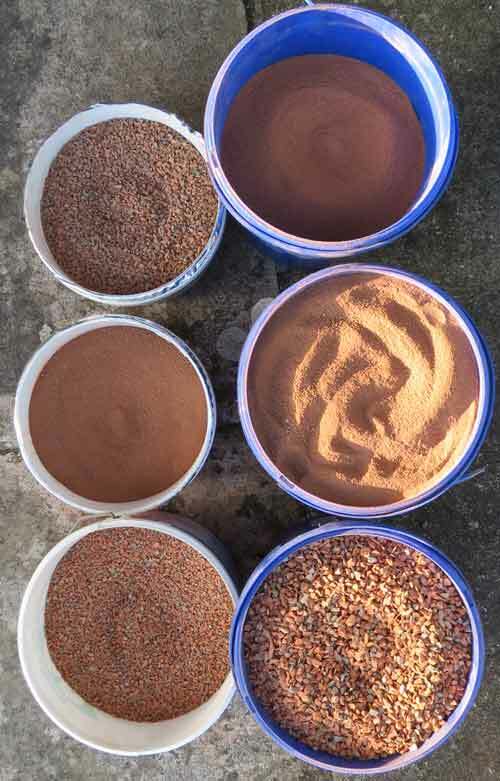 through a set of sieves so that it is separated into grades from fine to coarse. 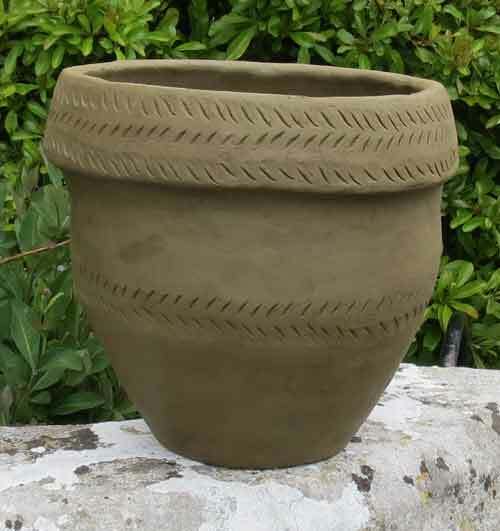 These are then added to the various clays in a range of proportions, together with ground-up sea-shells and fired flint. 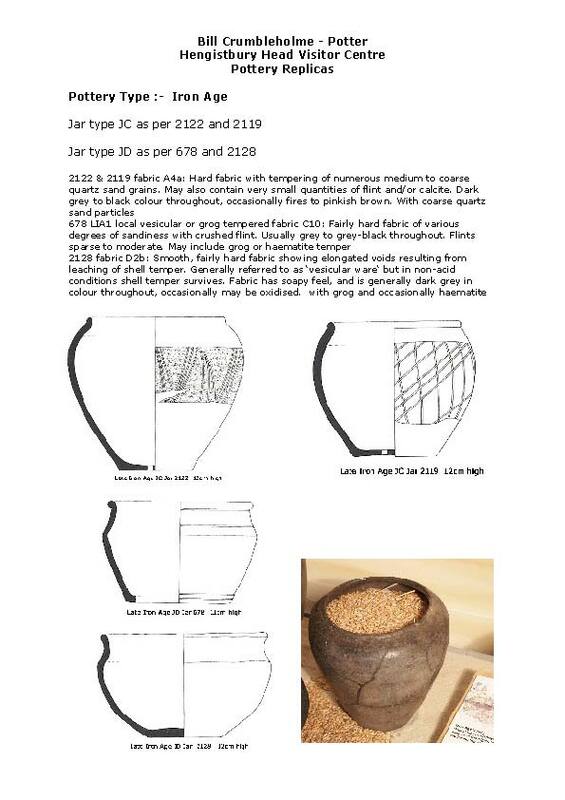 This should produce a collection of clay bodies suitable for the types of replica being produced. 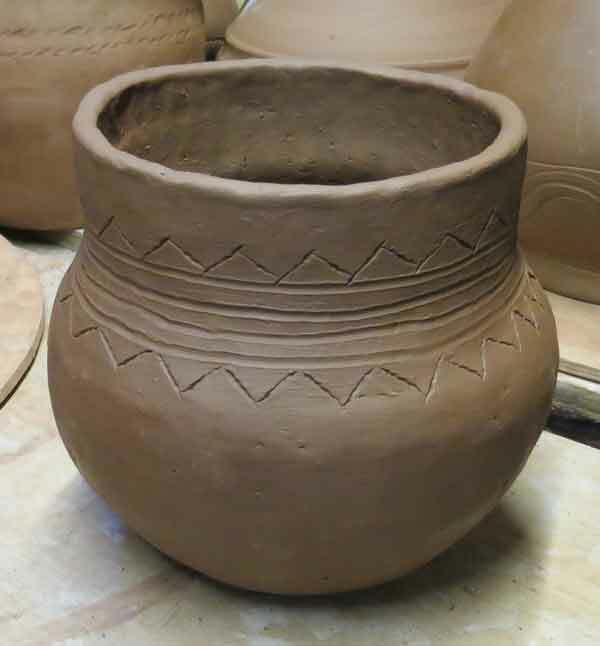 Grog and other materials are added to clay to increase the strength of the wares, during making, firing and use. It is found in ancient pottery, sometimes it can be seen on the surface, sometimes it is only apparent when broken pieces are carefully examined. 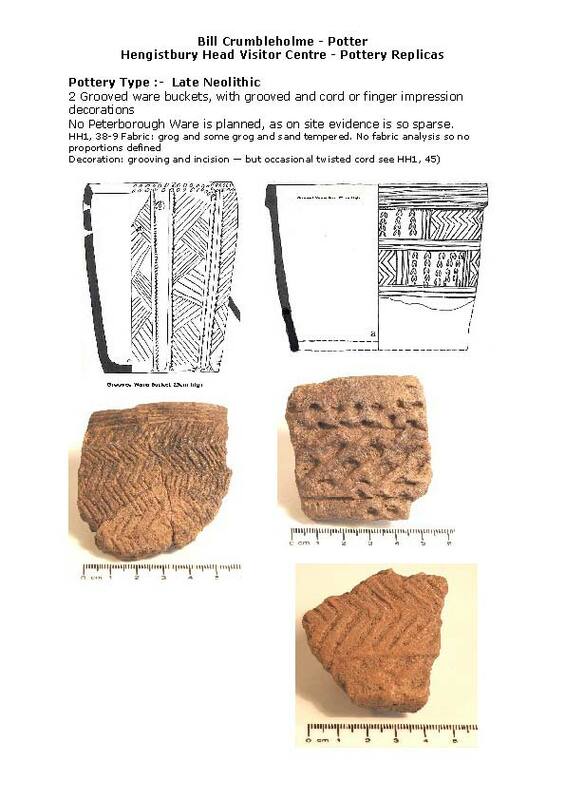 It is thought that some of these inclusions may have had "ritual significance", being made from ancestors' pots or using materials from special locations. Bill is worried about the sea-shells and flint, which he has not used before. 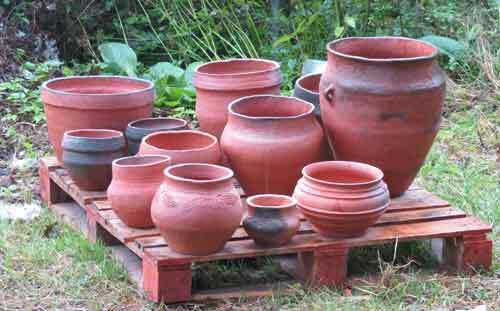 As a modern potter he would avoid contaminating his clay with these minerals, which are not very stable when heated. 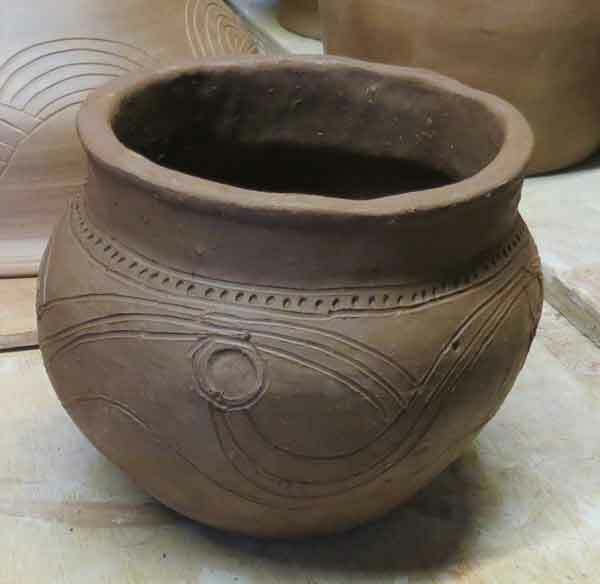 So this project is an opportunity to do some experimental archaeology and see what happens. 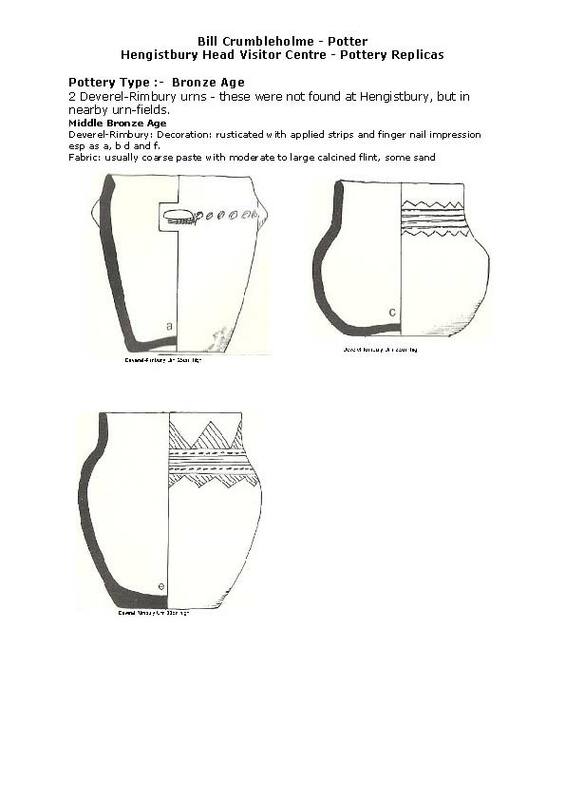 Set out below are the documents drawn up to describe all the pots being made. 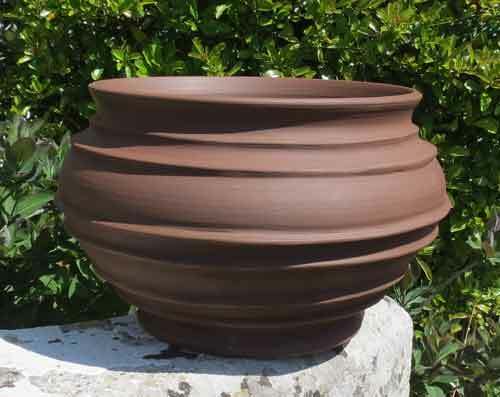 An image of each pot has been printed full size on card and the profile cut round to use as a template. 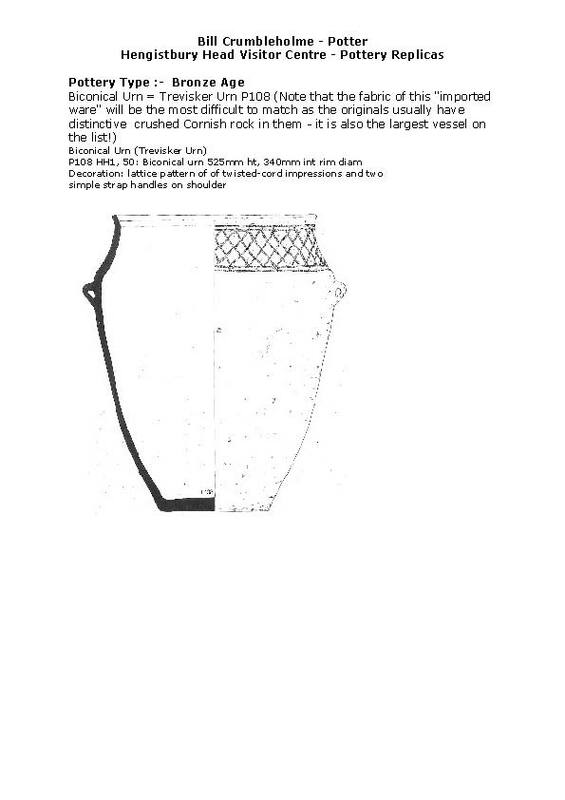 Details of the clay types and inclusions have been annotated on the drawings, to help sort out the differences.